When Tara Met Blog: The Hunger Games: Mockingjay Part 2 on Blu-ray! The Hunger Games: Mockingjay Part 2 on Blu-ray! With the Blu-ray release of the final installment of the franchise, The Hunger Games: Mockingjay - Part 2 (now available on Digital HD too), I now own the complete series. Personally, I love purchasing the combo packs, because I then have a copy for iTunes to watch when I'm traveling, a DVD to lend to my mom who still doesn't have a Blu-ray player, as well as a Blu-ray copy for us to watch at home in all its high-def glory. With $647 million worldwide box office and counting, The Hunger Games: Mockingjay - Part 2 set the world on fire and enthralled millions of devoted fans across the globe. Me too! The other day my husband and I re-watched the film together for a date night in and today while blogging and working, I had the film playing in the background with the audio commentary on by director Francis Lawrence and producer Nina Jacobson. I learned lots of fun facts like that a visual effects company was used to make Peeta more gaunt and skinny in the beginning when he's in the hospital bed. Also, interesting hearing about the nuance ways they tried to stay true to the author's version of the characters like Katniss not responding the way other women would when it comes to expressing her emotions. Cool and surreal to hear which scenes were filmed in Berlin or France too. One of the craziest parts to hear is that Jena Malone (Tribute Johanna Mason) had a scalp double instead of wearing a bald cap or shaving her head. Those are just a few of the insightful nuggets, so I'd highly recommend listening to the audio commentary while cooking, doing social media or something else, because while interesting to hear, its not necessary to watch uninterrupted. 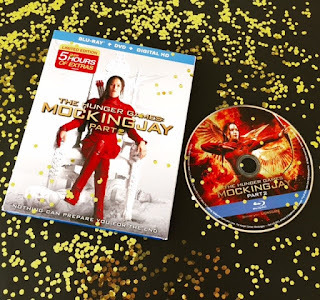 While I'm sad the series has come to an end, but with over 5 Hours of Special Features from Lionsgate included on the Blu-ray edition, fans can keep the saga living a little longer. “Pawns No More: Making The Hunger Games: Mockingjay - Part 2” is an 8-part documentary providing an in-depth look at the making of the film from production design, costumes, hair, make-up, stunts, special effects and post production. The documentary also includes a touching piece – from the last day of shooting – in which the cast reflects on their experience shooting the four films. Also included is a detailed look at Cinna’s sketchbook and a walk through the on-set photography. The Hunger Games: Mockingjay - Part 2 Blu-ray and DVD will be available for the suggested retail price of $39.99 and $29.95, respectively. Amazon meanwhile has the combo pack for only $19.99 --great for Mother's Day and Father's Day! Disclaimer: While I received a complimentary copy of the Blu-ray for review, I am not a capital mutt, so all opinions are my own, just like Katniss! Ha, I love your disclosure. Also, those mutts? Terrifying. Love this series so much, I'm sad it's over.